Welcome to Tour The Storm! Tour The Storm will take you to the wildest weather on Earth. Your driver and tour guide, Michael Phelps, has four decades of meteorology and storm chasing experience, having documented thousands of extreme weather events in all seasons, including over 400 tornadoes and a dozen major hurricanes. He is an Emmy Award winning storm chaser, and award winning meteorologist, having worked in local television and radio; The Weather Channel and the PGA Tour as an on-site meteorologist. He ran one of the very first storm chasing tours, Windstorm Tours, in the mid 1990’s. If safety, experience and getting the most amazing shots of storms is what you seek, then Tour The Storm is your storm chasing tour. 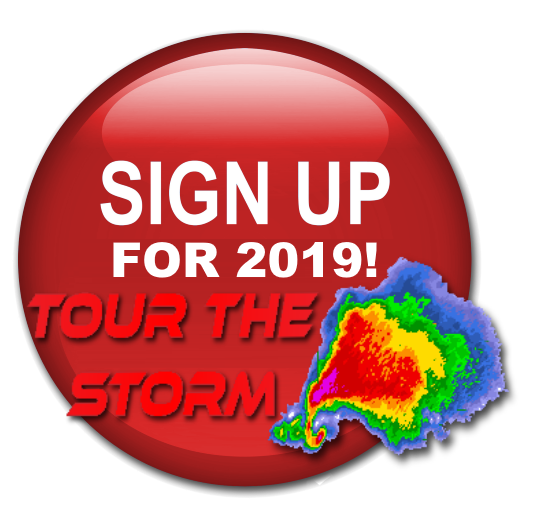 Tour The Storm tours are more comfortable and more personal than most storm chasing tours. We will have a fully equipped 12 passenger van with internet, and a maximum of 6 guests, so each guest has plenty of room in the tour vehicle. We offer a variety of affordable one week and 10 day tours throughout the storm season. We offer flexible payment schedules as well. Reserve a spot on one of our tours today! We’d like to thank you for choosing Tour The Storm! Our goal is to provide our chase tour partners the time of their lives and to experience the best that Mother Nature has to offer on active weather chase days. And on those occasional “down days”, we’ll show you the best local attractions such as national and state parks, natural landmarks and points of interest. Every day is filled with activity. No sitting around hotel rooms on a TTS (Tour The Storm) tour. And you are NOT just a customer to us, you are a true chase partner. Everyone has a role on active chase days. We’ll show you what to look for in severe weather and you’ll be a true storm spotter. Below is some information to make your adventure easier. If you have any questions, please email tour director Mike Phelps at mike@tourthestorm.com. What to bring- Please pack lightly as luggage space is limited. Many of the hotels we select have self-serve laundry facilities and most towns have laundromats. Weather in the plains tends to be warm and humid (75-90F) during chase season so bring cool, comfortable clothing. We also may visit mountain areas so one sweatshirt/light jacket would be wise. Bring any prescription medications you need. Bring a camera, of course, and don’t forget the charger or extra batteries. As for cell phones, bring them along but be aware that in remote areas the signal may be weak or non-existent. Our chase vehicles do not have the capability to provide plug-ins to recharge phones or cameras so be diligent in your battery use. And most important, bring your sense of adventure. Expenses- Your tour cost covers everything but food, drinks, souvenirs, laundry costs and any additional sundry items you may need. Tour guests must pay for airfare to and from OKC or DEN. Also, guests are responsible for booking first and last night hotel rooms. We cover all lodging during the actual tour. Guests are responsible for getting from the airport to the hotel and from the hotel to the airport. What happens on the tour- As everyone settles in at the hotel for the first evening, tour staff will evaluate the next days chase possibilities and let everyone know when we will depart the next morning, usually 9 or 10am depending on how far we need to drive. Most of the time, we will not stay at the same hotel two or more nights in a row so give yourself plenty of time to re-pack your bags. In the morning, a possible target chase area will be chosen. Breakfast is usually what the hotel provides or a drive-thru on the go meal. If time permits, we may stop at a store to stock up on snacks and drinks for the day (a cooler may be provided in the vehicle) Remember, you are a chase partner and spotter. If you see something we don’t, let us know. We’ll explain why we’re going to an area, what to look for as the day progresses and the different radars we use. And, PLEASE, ask us questions. Once we get to the chase area, we’ll reevaluate the data. We usually stop at a place with restroom facilities but any stops on the road are brief so please plan accordingly. A majority of the time on a chase is driving, then waiting. Watching the radar and the sky. It is a chess game with Mother Nature, staying a few moves ahead and anticipating the next move. Lunch and dinner are almost always on-the-go on active chase days but are never guaranteed. A chase can last 12 hours a day or more and be physically demanding. A main Tour The Storm goal is to inform and teach about storm structure, spotting, sky analysis and the tools used to make those decisions. A staff member will choose and book that nights’ hotel during the afternoon. On non-chase days, tour staff will choose area sites (state or national parks, points of interest) to visit. Hotels- We stay in major chain hotels (Super 8, Quality Inn etc) or independent motels where TTS staff has stayed before while chasing. We do not provide smoking rooms, and any penalties incurred for a guest smoking in a non-smoking room will be the sole responsibility of the guest. To make sure we all meet up and leave together on day one of the tours, and return back to the same location at the end, all tour guests are requested to make their reservations for their arrival and end of their tour at the same hotel. For the tours that begin and end in Oklahoma City, the hotel is the Country Inn and Suites by Wyndham. In Denver the hotel is the Days Inn Denver Airport. Free shuttle service is provided from the airport to the hotel, and from the hotel to the airport. Remember, you are responsible for booking the hotel for your arrival the night prior to the start of your tour, and the final night prior to your departure. Tour The Storm Tour Policies- Minimum age is 18 unless accompanied by a parent or legal guardian. No illegal drugs or alcohol are allowed in tour vehicles (except prescription drugs that you have listed on the waiver) If you choose to drink “after hours” please be responsible and do not let it affect the enjoyment of others on tour. 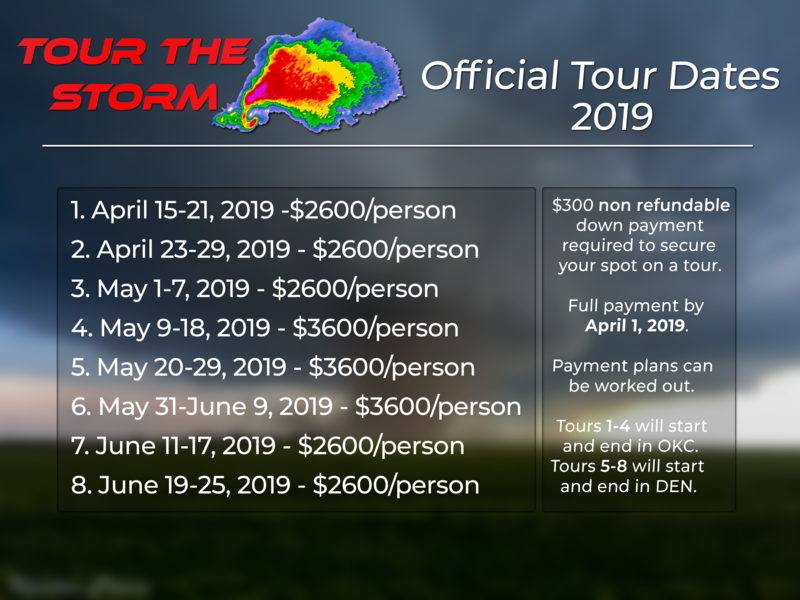 Tour The Storm Tours staff reserve the right to dismiss anyone from the tour early based on personal conduct that affects the safety or enjoyment of the tour guests or TTS staff WITHOUT REFUNDS. Smoking or smokeless tobacco is not allowed in tour vehicles or hotel rooms. The use of “vapor” electronic devices will be allowed after TTS staff approval. Please respect the other chase partners and the TTS employees and their right to enjoy the tour as you would. For many, this is a trip of a lifetime. If an issue needs to be raised, please let a TTS staff member know immediately so we can take care of it. We’re all in this together, so patience and respect for others goes far to make this the time of your life!! Copyright © 2016. Tour The Storm.